Based on our years of experience we have developed products that you help you as a manager or grower to achieve better results. Peter Stradiot is the initiator of crop tracking. The software products based on crop tracking are focused on the measurement of the growth of plants. You can follow the progress of your crops in an objective manner. Thus you can easily follow your schedule, organize your workforce and monitor your spending. More yield and less time and energy loss! Years of assessing plants was the start to measuring the activity of the plant in a very simple manner. 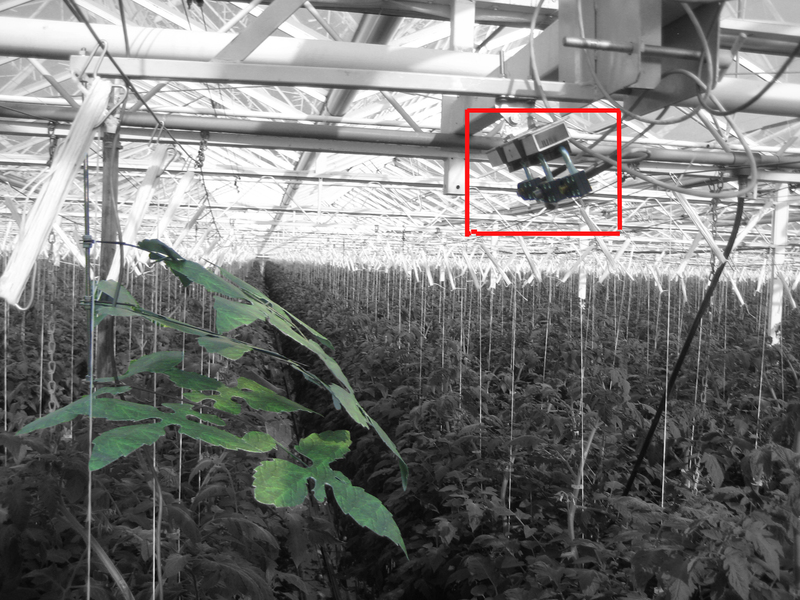 The artificial tomato, cucumber and pepper leafs set the reference to measure directly on the plant and to be able to intervene quicker and more accurately. The only weekly tomato-newsletter in the world! Tomato-News is a weekly newsletter about growing tomatoes under glass. What does Tomato-News offer you? Tomato-News is available in Dutch and French. Belgium and The Netherlands: cold winter and moderate summer, high-tech. Southern France: cold winter and hot summer, standard technology. You get over 250 practical suggestions a year: a successful application of one warning or suggestion can yield up to 1100 euro / ha. Also, you are quickly informed of new products, techniques, market shifts: you can therefore adjust your schedule in time. An individual growers subscription costs € 291 / year (excl. VAT, See delivery conditions). Special discounts are provided for businesses or cooperatives; contact us for more information. Get the newsletter 3 weeks for free. Subscribe now (in Dutch). The Plant Activity Sensor is an artificial tomato leaf that reacts to radiation (sun) and climate (temperature and air flow) like a natural tomato leaf. Infrared thermometers measure both surfaces (artificial and natural). The temperature difference between the two is what growers call "activity." You measure the influence of radiation or air currents in the greenhouse, instantly and on the crop. When using scales or water content meters, this is not the case. The PASensor measurement gives faster and better results. What can you visualize using the Plant Activity Sensor? Crop Tracking gives you week to week guidance. What does Crop tracking do? Every week you measure 10 plants and indicate the average weekly climate and irrigation values. Crop tracking automatically generates specific charts adapted to the needs of the grower, the work leader, sales manager, the manager / owner. Crop tracking allows to compare different years or different growers. The production plan for next year can be entered and the weekly progress of the crop can be checked. Crop Tracking is available in Dutch, English, French and Spanish. The intuition of the grower is supported by objective measurements. The result: fast and reliable decisions. The owner can evaluate the progress in his greenhouses objectively. At the start Crop Tracking results in 1 extra kg/m² and a steady improvement in subsequent years. The purchase of the software costs €1,500 (VAT excl., see delivery conditions). For an annual subscription to upgrades, additional space for crops, communication and personalized feedback (once a year), you pay € 500 (VAT excl., see delivery conditions). The Planning &- Risk software is management software that calculates based on the measurement of the crop, the climate and the irrigation, the crucial data for controlling the crops. The program also provides suggestions for actions that lead to optimal harvest. What does the Planning & Risk Software do? The software autonomously suggests actions concerning climate, irrigation and division of labor. Planning & Risk gives you a weekly valuation of your crop management capabilities. The software indicates what values are outside the safety zone. The production plan for next year can be entered and the weekly progress of the crops can be checked. Planning & Risk allows to compare: between different years, different growers, your schedule and weekly data. A margin increase of more than 5% in high-tech greenhouses is feasible. Rapid information on risk growth increases your fruit quality by a few percent. Planning & Risk replaces a high-level education, thus saving you over € 4,000. The LAI & Plant Colour Analyzer is a software tool that calculates, through a digital photo of the leaf, the leaf surface and the green level. The Leaf Area Index (LAI) or index for the leaf surface, is a number that gives you the surface of leaves per square meter greenhouse. What does the LAI & Plant Colour Analyzer do? The number of leaves is NOT a good indicator of LAI as the length and width and the padding of the leaves change during the growing season. There is an optimum balance between sunlight and the LAI of the plant: the more LAI, the more the more perspiration and moisture there is in the greenhouse. In summer it produces a crop more if there is a higher LAI. The color of the crop is important to assess the crop. We express the color in RGB values. avoid blossom end rot by maintaining a proper balance between the LAI and the number of fruits. save energy with the optimum LAI. know the optimum number of leaves to remove so you make better use your labor. detect with the color analysis quickly whether your crops go 'out of shape'. The software and 'the easy surface', to make pictures, cost € 1,250 (VAT excl., ex works, see delivery - Digital Camera NOT included). Propagrow is a package (hardware and software) that visualizes the growth volume of young plants with a simple standard digital camera. What can you do with Propagrow? You save 5-10% of energy by making optimal use of artificial light. You can also calculate the cost implication of any customer request.